Film Ha Ha turned two the other day (wahey!). The site was actually started less than 48 hours before the 2011 Japan tsunami. You have likely seen the anniversary of the disaster being marked in the media over the last few days, with a particular focus on how the repercussions of the Fukushima nuclear incident are still being felt. Meanwhile, Japanese director Sion Sono has become the most regularly reviewed auteur on this site - I'd reviewed three of his new releases in barely a year (Cold Fish, Guilty of Romance and Himizu). 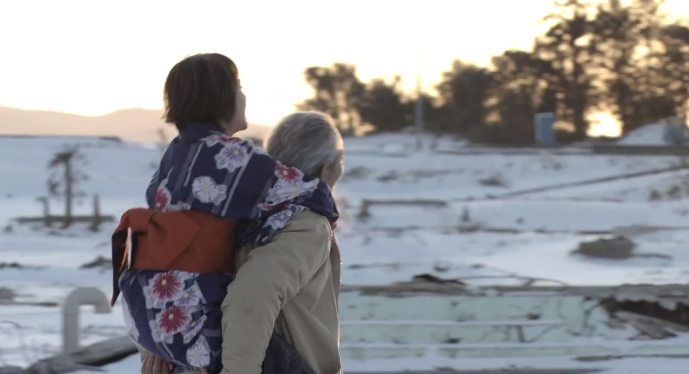 With all that in mind, I can't think of any more appropriate time to discuss The Land of Hope, Sono's second reflection on the aftermath of the March 2011 disaster. Fans be warned: on a purely surface level, Sono's latest is an altogether more traditional film that you might be expecting. Not to say there aren't very strong indicators of his presence - several of his regular actors return (his wife Megumi Kagurazaka most notably, now more appropriately dressed than her GoR and Himizu appearances) and it has his trademark extended running length. Thematically, the film is very much a companion piece to Himizu. But altogether Land of Hope plays like a much more conventional and accessible film than his oftentimes extreme, off-the-wall previous work. Stylistically, it also marks somewhat of a departure. In a particularly shocking break from tradition, Sono abandons his over-reliance on Requiem Mass in D Minor and Adagio for Strings and even includes some original compositions (ably assisted by Mahler's Symphony No. 10 at climactic junctures). If one were forced to pigeonhole, 'family melodrama' would almost be the most appropriate descriptor. Being kind, one might suggest a touch of Ozu, whereas at least one less than impressed reviewer dismissed it as mere television movie material. Such a basic reading will only get us so far, but let's first analyse the film on those most simple of terms. The story concerns two neighbouring families, literally separated when a fence marking a 20km exclusion zone is erected between their houses following a tsunami and nuclear disaster. The film is set in a fictionalised Nagashima Prefrecture, with events taking place some time after the Fukushima incident - I'll get to the reasons behind that initially strange decision later. Elderly farmer Yasuhiko (Isao Natsuyagi) chooses to stay in the family home with Alzheimer's-suffering wife Chieko (Naoko Otani) despite the threat of radiation. Their son son Yoichi (Jun Murakami) reluctantly evacuate to his city apartment with wife Izumi (Kagurazaka). Their neighbours meanwhile, in a subplot that admittedly feels a touch underdeveloped at times, are sent to an evacuation camp, but their young son Mitsuru (Yutaka Shimizu) attempts to break into the quarantine zone with girlfriend Yoko (Hikari Kajiwara) to try and find out what happened to Yoko's family in their coastal hometown. This is mostly strong, poignant material, even if the film does occasionally threaten to veer into more regrettably sentimental directions. The characters attempting to deal with extraordinary circumstances in devastatingly ordinary ways. Yasuhiko finds it impossible to abandon his home for increasingly convincing reasons. Izumi contracts 'radiophobia' - a fear of radiation - that is deepened by the discovery that she is pregnant. The direction & cinematography are relatively straightforward, arguably even pedestrian at times, but enlivened by numerous beautiful moments such as a couple of saunters through a snowy, abandoned exclusion zone. It's haunting stuff, and I'm not just talking about the mid-film appearance of two potentially ghostly figures. A strongly edited sequence invokes the recurrent image and sound of a stake being driven into the ground to both literally and symbolically represent the distance between not Yasuhiko and Yoichi, but also their respective generations and attitudes. It's makes for a sympathetic portrayal of ordinary victims coping with a life-altering disaster, albeit on a longer-term than the immediate aftermath. If it was just that, it would be a decent if unsubtle film, although a disappointment from a director as brave & bold as Sion Sono. Ah, but there's more to The Land of Hope than meets the eye! Indeed, the title itself is misleading - the hope offered here is an ironic sort, tinged with the bittersweet. The film serves as a passionate, intelligent critique of both nuclear power and the ineffectual government's disaster response. There is a quiet yet omnipotent undercurrent of authorial untruth and misjudgements influencing the events of the film's narrative - this is an angry film, although in a more subtle manner than Himizu's raw aggression. There's also a frustration at the continued prevalence of nuclear power - as the film continues on, Sono's seemingly peculiar decision to stage his drama in a near future setting rather than Fukushima itself begins to make a whole lot of sense. Indeed, through Yasuhiko's disheartened recollections of failed protests and a dust covered Geiger counter (purchased in response to Chernobyl), Sono wonders why Japan even found itself as a nuclear powered country in the first place. Furthermore, the film ends on several incredibly ambiguous notes. The shocking conclusion to Yasuhiko's story takes place in the absence of hope and a (literal) burning of tradition & history. Yoichi and Izumi are destined to forever struggle to find safety and peace - their purposefully trite final exchange about the 'power of love' doesn't even convince themselves of the possibility of a hopeful, joyous future. Mitsuru and Yoko wander a destroyed landscape, dreaming of a potential bright future in the face of an unforgettable past. If much of the film deceptively plays like a continuation of Himizu's briefly hopeful ending, the ending of Land of Hope is determined by uncertainty without ever abandoning its humanity and quiet optimism. In a Sion Sono film, happiness is never easily achieved although is something to always fight for. Read this as a simplistic melodrama and you're missing the provocative core of the director's more complex intentions. This is undoubtedly a thoughtful, respectful examination of the human cost of disaster, and how the repercussions are much deeper than the immediate, media-covered devastation. Sono finds terrible beauty in the wintery destruction without forgetting the human response to incomprehensible change. As an emotional & melodramatic drama remembering 11th March 2011, Land of Hope works well enough. Underneath, however, this is a film that's also deeply concerned about the future, and that's what ultimately makes it so much more than a merely good-intentioned family drama. Sono doesn't seek to solely portray, he also attempts to understand.